Reflections and notes from the second day…. Jen Vaughn, Jacq Cohen, Kristy Valenti, and everyone at Fantagraphics were wonderful. But… few people came to the signing. Thanks to Perry Ostrin, Charles Hatfield, and Karen Green for visiting, and even buying a book! Fun to chat with Paul Hornschemeier, Jacq, and a few others. And, I’ll be there again Saturday 9-10 and Sunday 2-4. Don’t be shy! I was struck by how cos-play puts the body on display. The costumes invite us to look, whether they are form-fitting Spandex, gigantic robots, or the Tardis. 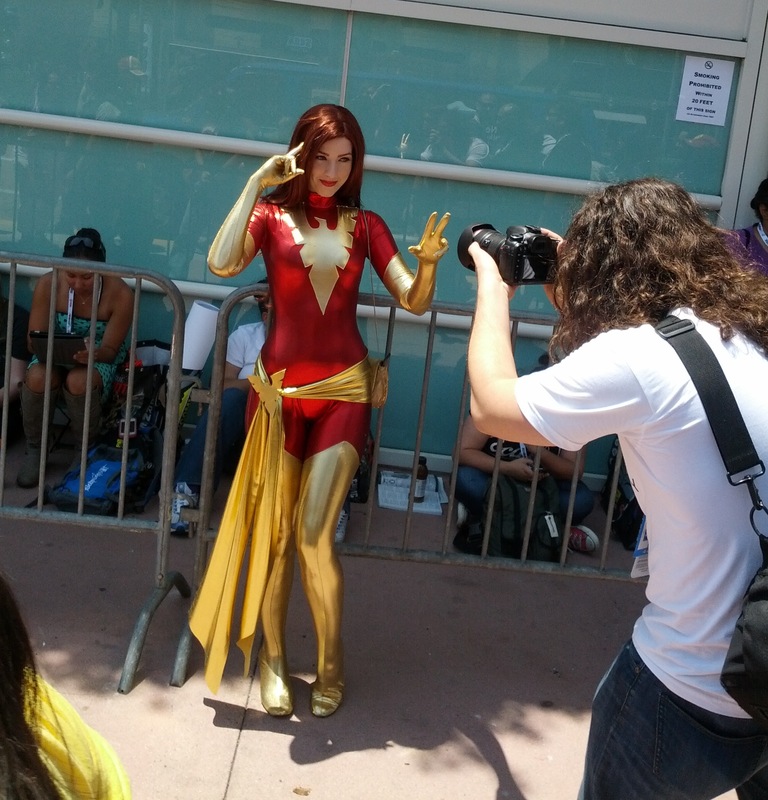 Costumed Comic-Con-goers stop and pose for photographers, amateur or professional (though mostly amateur). They pose in the manner of their character, or interact with another character. They get into character. They smile. Or scowl. You might interpret them as colluding in their own objectification. Or perhaps they’re using their bodies to interpellate viewers. Whether the costume disempowers or empowers, it’s hard not to look. The photo above is by Ben Towle. My impulse to photograph costumed people frequently collided with my worry that photographing costumed people would be voyeuristic,… despite the fact that costumed people seemed happy to be photographed (and, as you can see above, create excellent costumes!). UPA was trying to prove that any art could be animated. It just had to be the right art. … What the essence of UPA was was that they didn’t have a house style. … They didn’t have a standard — until they came up with Mr. Magoo, and then they got locked in to that. — Deitch on Terrytoons, prior to his time there. Thinking that a 45-minute wait in the long, snaking line would get us to the Sherlock panel in room 20, we got in line. 45 minutes later, we decided to stay in line because the next event in room 20 would be The X-Files 20th-anniversary reunion, featuring both David Duchovny and Gillian Anderson. After nearly two hours in line, we realized… no. We’d never get there in time. Stepping out of line and seeing how many more zigs and zags were ahead of us, we realized we were right. 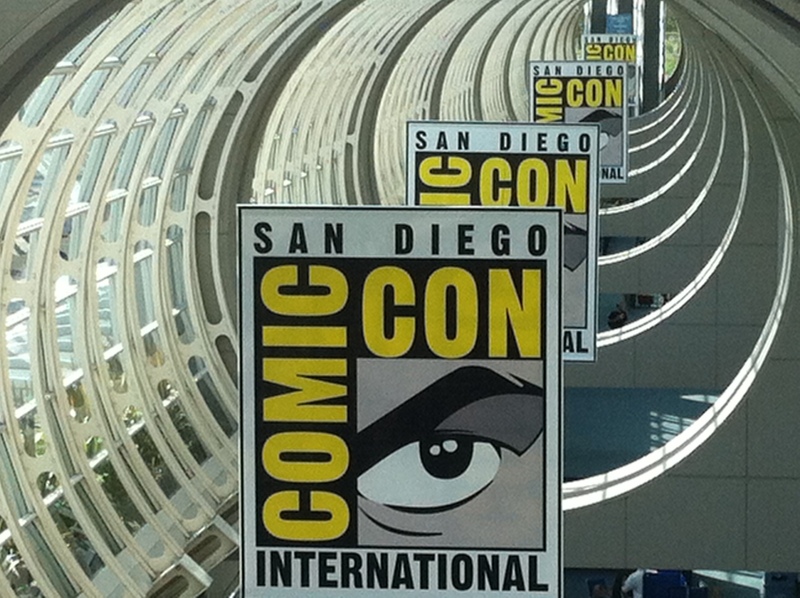 The moral of our story: You can either go to one Big Media Event, or you can attend Comic-Con. The latter is the better way to go. Tom Gauld, who creates cartoons for both The Guardian and The New York Times, does brilliant, Gorey-esque work. Not surprisingly, he acknowledges Gorey as a major influence. 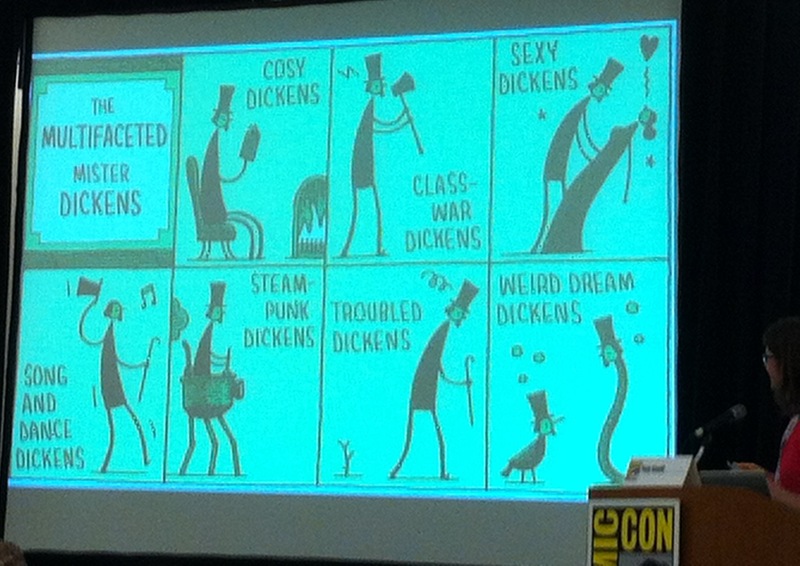 Only caught the second half of this panel, but I’m definitely going to buy his books tomorrow. Smith arrived few minutes late because of a Make-a-Wish Foundation request. He then did a reading from Rasl and talked about some of the technology that informs the project. 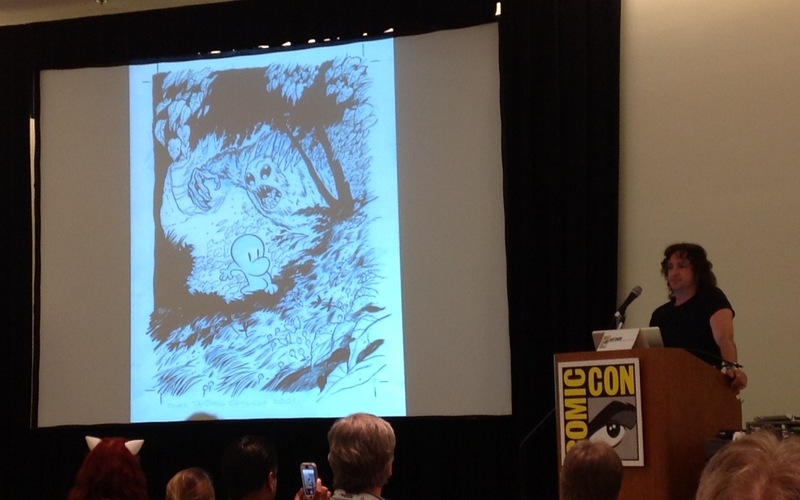 In November, Jeff Smith is starting a new webcomic. It’s called Tuki. It’s “a lot more like Bone than like Rasl,” he says. It’s set 2 million years ago, in Africa. It’s the story of Tuki, the first human to leave Africa. Thanks to the Scholastic editions of Bone, he gets lots of fan mail. The two things that get drawn the most by kids are: (1) Gran’ma Ben’s house on fire, and (2) the Dragon coming to the rescue. Question: What artists are out there right now who you’re into? Jeff Smith answers, “My friend Paul Pope. … I think Paul’s grasp of the dynamics of comics are about as good as anyone I’ve seen since Kirby. 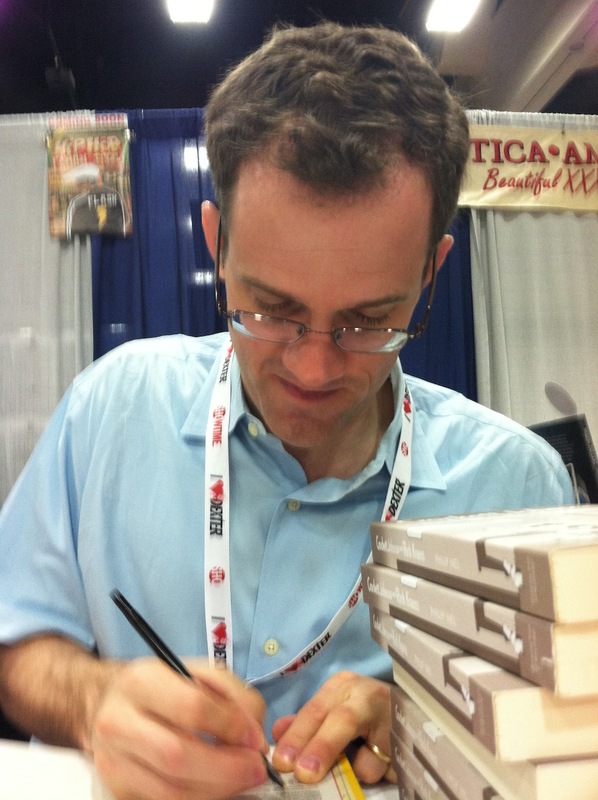 And I’m not exaggerating.” He adds, “I’m a huge fan of Kate Beaton, the Canadian cartoonist who does ‘Hark, a Vagrant. '” And he likes: Faith Erin Hicks, Ed Piskor, Eleanor Davis, Jim Rugg, Jeffrey Brown. 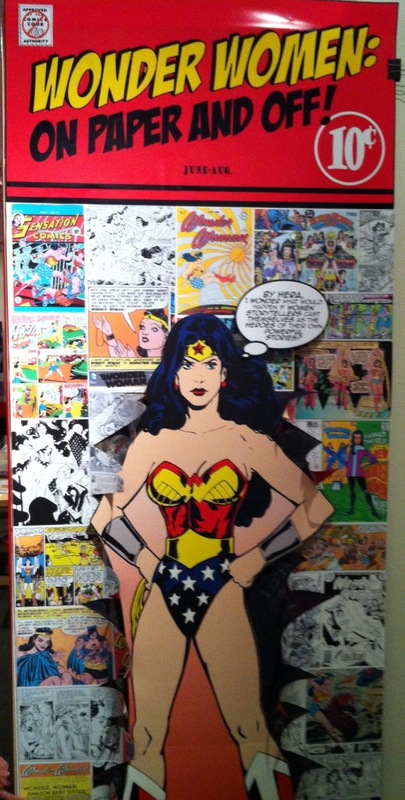 After dinner with Ben Towle and the Hatfields, we went out to the Women’s Museum of California for “Wonder Women: On Paper and Off,” at which Trina Robbins, Ramona Fradon, and Mary Fleener — all pioneering women in their field — shared their experiences of working in the comic industry. Though a defunct microphone and plane traffic overhead made hearing a bit challenging, it was well worth venturing away from Comic-Con for this event. Trina Robins’ final and definitive history of women cartoonists — Pretty in Ink — will appear in the fall. Her collection makes up the bulk of the exhibit, which runs through September 1st. If you’re in the area, check it out! Ramona Fradon has worked for DC since 1951. She worked on Aquaman, and co-created Metamorpho. She worked on Superfriends, Plastic Man. She also spent 15 years drawing Brenda Starr, 1980-1995. Mary Fleener started doing comics in 1984, inspired by an article Matt Groening wrote on mini-comics. If you don’t know her Life of The Party, check it out — autobiographical comics that are both formally challenging and engaging. Fleener noted that the Hernandez Brothers got a lot of women into comics because Love & Rockets had a predominantly female cast of characters. Love & Rockets inspired Fleener. And then the underground comics in the 1980s were more autobiographical, offered a woman’s point of view. Fradon, one of the few women working in comics in the 1950s and 1960s and 1970s, described her experience: “All the time I was working in comics drawing superheroes I was having daily identity crises. I just didn’t identify. I didn’t like violence. The angles you had to draw were so extreme.” She got into comics because she was a good artist. 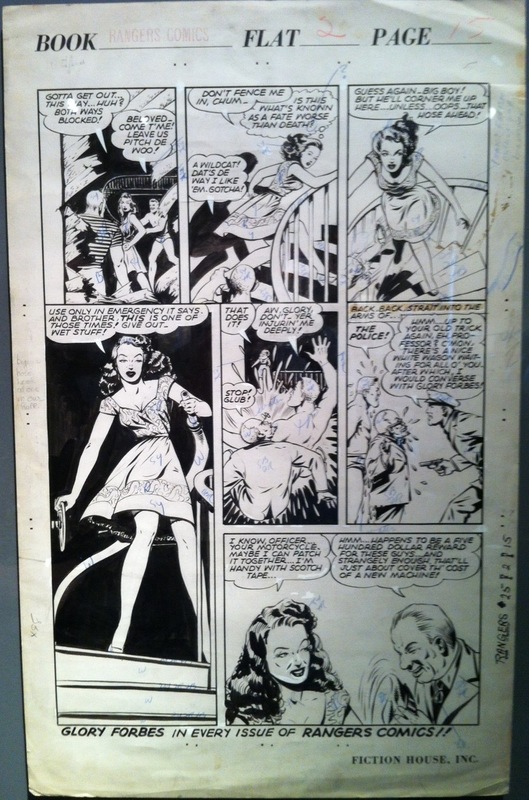 Her husband, an aspiring New Yorker cartoonist encouraged her to pursue comics. So, she did, and made a respectable living at it. All panelists said much more of interest, but since I need to get to bed (it’s 1:30 am as I write this sentence), I’ll offer a few quotations from them. Above: Glory Forbes by Fran Hopper (mid-1940s). That’s all for now. Tune in again tomorrow! I am the guy who was sitting next to you at the women’s museum. I’ve enjoyed all your posts on comic-con. Sounds like you had a great time. Thanks for writing about the panel!